One of our most visible garden beds has been, since day 1, a total weedy mess. Rumor has it there used to be nice flowers in there but the previous owners yanked them before moving on. I can verify this, since there were sinkholes all over the place where plants had once been. Last year was torture; I kept eyeing it, wishing we could somehow wipe it out and make it better. But we were busy with other projects, and landscaping was not even remotely in the budget. So it taunted me, growing bigger and braver weeds every day. When spring came around this year, it once again filled up with a tangled blob of nothingness that made me flinch every time I drove up. This year, I finally got around to making some improvements. But, always short on funds, I couldn’t go with a blue-sky approach. I had to be realistic, and frugal. 1. Remove ALL weeds. This allowed me to see what was salvageable. 2. Carefully remove the plants worth saving. Water them, and leave them out on the lawn to sun themselves. Dump the rest. 3. Till up the existing soil, add some new topsoil to give it some nutrients, and cover the whole thing with weed barrier. 4. Buy a few new filler plants (we had a leftover wedding gift certificate, hallelujah!) 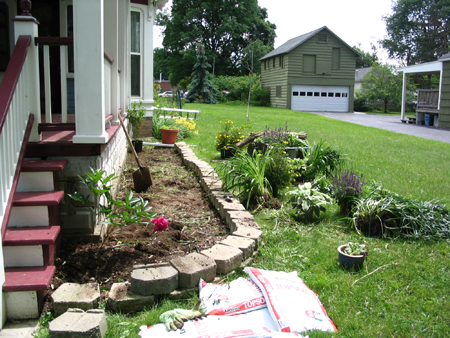 – I bought 2 potentillas, 2 salvia, 3 hostas, and a rhodedendrum. 5. Reposition everything, moving them around until I found the most aesthetic arrangement. 6. Dig, dig, dig – and replant. And water really well. 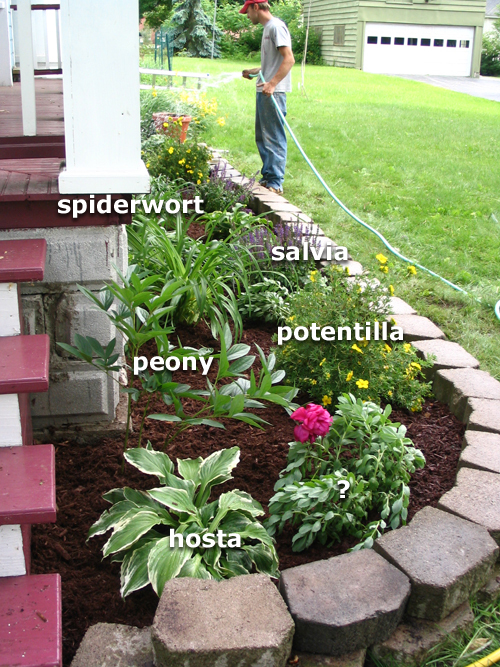 Lay down a whole bunch of dark brown mulch to make it look purdy. 7. Stand back and take photos of the new and improved, nearly cost-free garden! I’m not sure, but I htink your “?” plant may be a peony. I have 2 white-flowered plants that look the same, and a friend recently told me that’s what they are. Ooohh! That looks lovely and you only just planted it! Keep it watered and you will have a beautiful garden- that’s the key we have found. Di – the plant to the left of the “?” is a peony – that is it’s flower, leaning over to the them right., But the other one – which I snuck out of Teague’s parents’ yard during our big free-tree-dig day – s a mystery plant. Jocelyn – I hear you on the water – I killed nearly everything last summer by neglecting to water regularly, but this year we’re off to a much better start. I just bought geraniums and some various other annuals on sale, and I’m determined to keep them alive. Wish me luck…. oooooh gorgeous! you know we have a thing for the garden. It’s looking beautiful! very cool looks great!!! years ago i had lots of kids at home so big groc bill so no money for gardening. [i wasnt a good gardener anyway ] but since we lived in iowa and just about anything grows there i planted pumpkins. verrry cheap covered the entire area that was just dirt and had these great orange flowers. 1 seed packet was all i put in .